A fluffy throw makes chilly nights warmer. 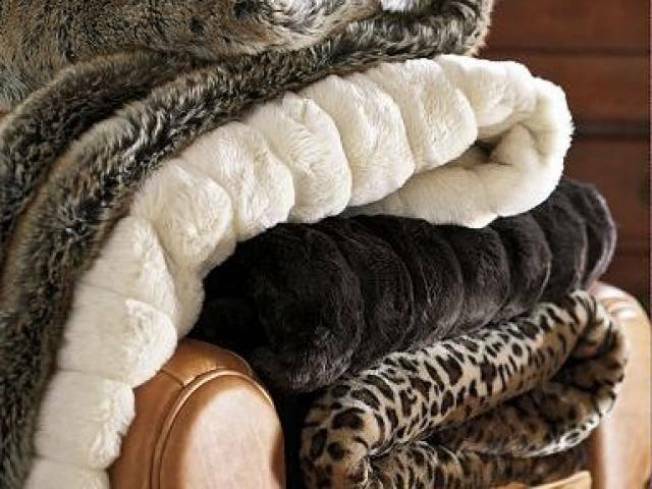 WARM AND COZY: It might not be a Snuggie, but you’ll appreciate the warmth (and stylish nature) of these plush faux-fur throws that are reminiscent of vintage mink coats. Sorry Snuggie, you've got some better-looking competition. On sale for $119 at Pottery Barn. DIOR ME: Get your color on at Saks Fifth Avenue this Thursday, November 18, when the store will be holding three Dior makeup application sessions where you can learn how to apply makeup like the pros. That means no more excuses to leave the house looking like an 80’s prom queen, sorry ladies. More info here. WOODLAND CREATURES: The silhouetted wood coasters by Ponko are hand drawn silhouette figures that have been laser cut from Colour Rimu wood and hand rubbed with tung oil. How about that for a conversation piece. Get them here.